Misfit of Interests instead of the “Goodness of Fit”? Dissertation von Andrzej Ancygier, Verlag Dr. Kovač 2013, 458 S.
Home > Verlagsprogramm > Politikwissenschaft > Schriften zur Europapolitik > Andrzej Ancygier: Misfit of Interests instead of the “Goodness of Fit”? 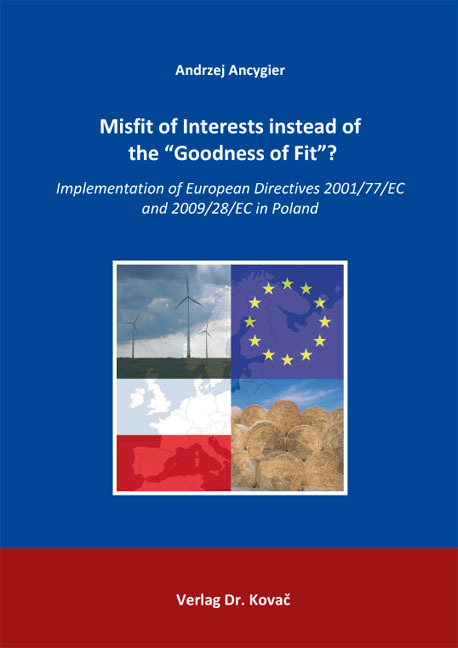 Andrzej Ancygier: Misfit of Interests instead of the “Goodness of Fit”? Misfit of Interests instead of the “Goodness of Fit”? This book analyzes the implementation of the European renewable energy directives 2001/77/EC and 2009/28/EC in Poland. By providing a thorough analysis of the process of adoption of each of these directives in Brussels and its subsequent implementation in Poland, it explains the reasons for the lacking or delayed implementation of the European laws in the member countries. The discrepancy between the interests of the actors participating in the policy making process at the European level, and the interests of those shaping a policy at the national level, seems to significantly influence the speed and effectiveness of the implementation of the European directives. To assess the scope of the discrepancy of interests between the European and national level it is not only necessary to analyze the interests of the actors at the respective level, but also their ability to influence certain policy. Whereas renewable energy associations and environmental non-governmental organizations enjoy good relations with the representatives of the European Commission and the European Parliament, in Poland it is the conventional energy industry which can significantly influence the policy making process. Therefore the ambitious renewable energy and climate goals adopted in Brussels can only with difficulty be implemented in Poland. The book also includes a detailed description of the discussion over the renewable energy act the adoption of which should finish the process of implementation of directive 2009/28/EC in Poland. A close analysis of the different drafts of the law shows, that the institutional framework within which the policy making process takes place is decisive in allowing some actors to influence the content of a policy and ignoring the interests of other stakeholders. Therefore the notion of the channels of influence which allow only certain interests to find their way into the decision making process, turns out to be of great value in predicting the outcome of the negotiations at the European and national level.